Yacht automatically sends all position report are called "beacon text" * sent, as required by VHF 2m 144.800 MHz and text messages / messages. Content example "Anchor in a beautiful bay on Lefkas." 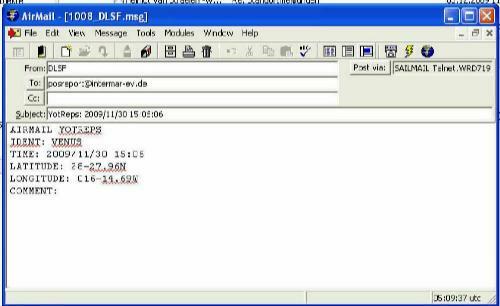 Yacht sends automatically or manually via PSKmail APRS position report on the frequencies of PSKmail server. In addition, text messages, course, speed and weather board. Yacht sends approximately every 24 hours manually position a message via shortwave *. Pactor relays. (Link) * to Winlink. Text messages / messages as "Comments" (as above) sent. Contents as above. 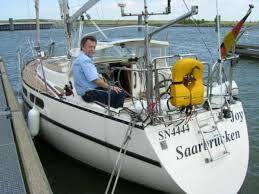 Yacht sends approximately every 24 hours manually send a position report as email: posreport@intermar-ev.de via shortwave to Sail mail relays or other providers such as Kielradio. Text messages are called "Comment" (as above) sent. Filter as above. Please call: SY-MONA eg sailing yacht Yacht name MY-HAI motor yacht Yacht name (mandatory SY (yacht) MY (motor yacht) and uppercase letters). Please note the minus sign "-" must not be forgotten. Yacht prior to departure to send email: yacht mail ... Intermar-ev.de with departure time, position, destination, average speed. INTERMAR transmits this data manually, system automatically plots. Note: possible way send more about Relay Pos INTERMAR case. Warning (valid for 1 - 5): Always at the port of arrival or last PosReport Submit Report. Otherwise, the last sent position off the coast remains nine days on the map! 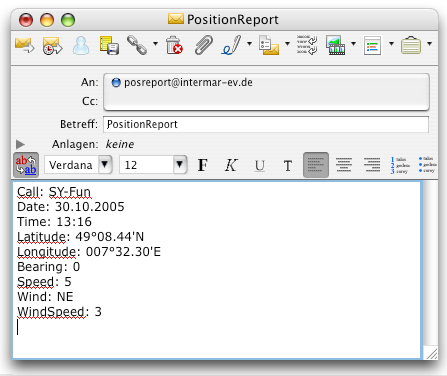 Position report as normal "email"
Note: please be sure to enter a space after the colons note! (Outlook is by default set to "HTML"). (which is automatically set the correct email format). Über die Taste Submit Position kann man direkt über die Webseite ein Position eingeben. Alle Schritte durchgehen, Wetter Kurs und Speed nicht erforderlich im Moment. Specify e-mail letters in the subject necessarily INTERMAR, call or ship name!